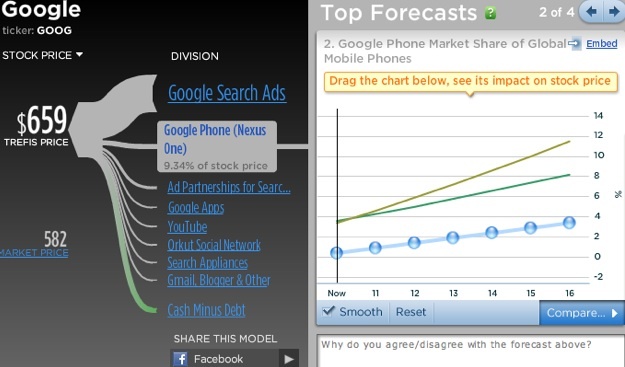 Can The Nexus One Add $20 Billion To Google's Market Value? How much exactly is the Nexus One line of Android phones worth to Google? The folks at Trefis have modeled Nexus One sales into their financial forecast for Google and estimate that it will account for nearly $20 billion of Google’s market cap (based on its target price pf $659 per share), accounting for 9.3 percent of the total. That is more than its estimated contribution of ad and search partnerships (5.1 percent), Google Apps (3.2 percent) or YouTube (2.4 percent). Only search ads account for more of Google’s total value (68.1 percent). How does Trefis come up with these numbers? Trefis is an investing site which comes up with financial models for stocks which translate into interactive stock charts and price targets. If you don’t agree with their model, you can change some of the underlying assumption sin the drag-able charts and create your own model (see below). Trefis is assuming Google will sell 5 million Nexus One phones this year, and that the Nexus One market share will grow from 0.4 percent this year to 3.4 percent in 2016, when the iPhone will have an 11.5 percent global mobile phone market share (as shown by the olive-colored line above) and Blackberry will have an 8.2 percent share (green line). While it’s fun to play around with these numbers, nobody can really predict how successful the Nexus One family will be. And it is not safe to assume typical mobile phone margins since Google has other motivations for pushing these phones, namely to increase adoption of the mobile Web where it will make its real money through mobile search. Also, this model does not take into account the software revenues from all the other Android phones out there. It is only Nexus One. Trefis estimats that Googl eis making a $231 gross profit on each phone, based on iSuppli’ s$174 component cost estimate plus other costs such as warranty, R&D ($50), and HTC’s cut ($75). Google has publicly stated that the profits from the Nexus One are minimal. Yet, if two thirds of Apple’s market share can be attributed to the iPhone (as estimated by Trefis), it doesn’t seem like a stretch to think that Nexus One can become 9 percent of Google’s. 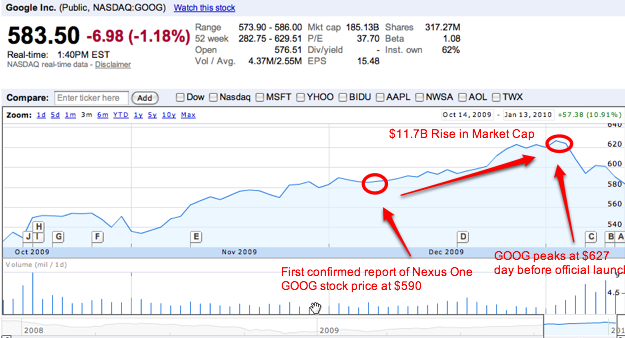 In fact, if you look at Google’s stock price on the day before the Nexus One was confirmed, it was $590, and it rose to $627 just before the official launch on January 5, adding nearly $12 billion to Google’s market cap in that time alone. Of course, there were other factors contributing to the stock’s rise during that time, but an extra $20 billion on top of Google’s current $185 billion market cap is not unthinkable. (The stock today is trading at $585, after the disclosure that it might be exiting the China market). How much do you think Nexus One is worth to Google?